Contents of the Sacred Heart Catholic School cornerstone time capsule. Marshfield, WI (OnFocus) A piece of Marshfield history was unearthed this week by Sacred Heart Catholic Church, which uncovered a time capsule dating to August 1916 in the cornerstone of the school during demolition. The existence of the box was already known, and once removed was handed over to the church for a low-key opening this week. Its contents revealed stiff yellow newspapers printed in both English and German, a handful of coins in various denominations, a document from the Diocese of La Crosse, a business card from the general contractor, and last of all, a string. 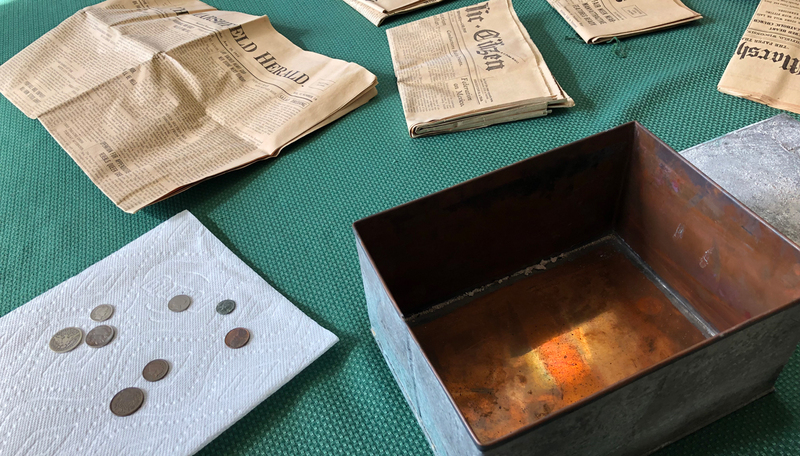 Newspapers placed inside the 4.5 x 6.5 by 8.5 inch copper box reported the details of the cornerstone ceremony to take place August 27, 1916 at 3 p.m, performed by Father Volz, pastor of St. John’s. The Marshfield News (“The Paper that Goes Home”) reported in its August 24, 1916 issue that a German sermon would be conducted by Father Wernerus of Rozellville and an English sermon by Father Condon of La Crosse, “one of the most noted pulpit orators of the northwest.” These would follow the sealing of the box inside Indiana-mined White Bedford mineral. The cornerstone could be tapped for a fee of $1 per tap. Members of both congregations met at St. John’s church at 2:30 p.m. for a short service before marching to Sacred Heart church in order of boys’ band, Catholic men’s societies, Sacred Heart congregation, St. John’s congregation, citizens in general, priests and servers. While The Marshfield News reported that 1916 coins of denominations up to $1 would be included, the actual coins are more varied (A corresponding report in The Marshfield Herald of Aug. 26 just noted that coins were of various denominations, without specifying a year). What ended up in the box was a 1912 dime, 1916 penny, 1889 Indian Head cent, 1867 2 cent coin, 1916 Buffalo nickel, 1904 quarter, 1865 3 cent nickel, and an ancient Roman coin. 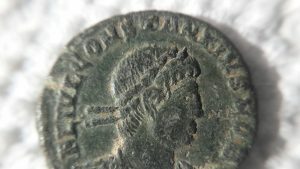 Kitzhaber sent a picture of the Roman coin to friend who could speak Latin and Greek. Not all of the lettering on the coin could be read, but the coin’s age was estimated to be about 2,000 years old. However, despite its historic value, the coin itself isn’t worth much. “It’s rare, but because there were so many made and it’s the lowest form of currency, it’s kind of like finding a 200 year-old penny,” noted Kitzhaber. 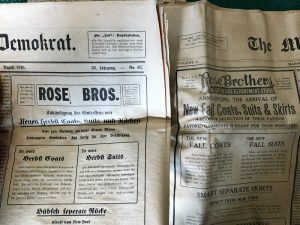 Other newspapers placed inside the box included diocesan papers, The Catholic Citizen and The Patriot (German), both of Milwaukee; also, The Marshfield Times and Marshfield Demokrat (German). A Latin document from the Diocese of La Crosse listed Pope Benedict XV in his second year in the Papacy, Bishop James Schwebach, new Sacred Heart pastor Hubert Stehling, U.S President Woodrow Wilson, Wisconsin Governor Emanuel Philipp, Marshfield mayor Albert Felker, and Father Joseph Volz of St. John. Finished in 1917, Sacred Heart Catholic School on S. Central Avenue functioned as a church, convent, and auditorium. Rev. H. J. Stehling, assistant pastor for two years at St. John’s, became Sacred Heart’s pastor. Overcrowding at St. John the Baptist Catholic Church led to the project. Once the building was completed, those who lived within the geographic region were required to switch parishes to help establish the new church. A Tudor Gothic style church was later finished in 1932 to accommodate the growing congregation. The school would eventually close after the 2001-02 school year due to low attendance. After-school program Youth Net used the space before moving into the new YMCA last summer. Upkeep for the facility, combined with asbestos and lack of accessibility, led to the decision to tear down the school and eventually replace it with a smaller building. Demolition of the school is near completion but there is no hurry for the parish, which doesn’t plan to break ground for the new facility anytime soon. An ad in both English and German papers. The closer looks at newspaper reports in 1916 show a snapshot of Marshfield’s history as it stood over a hundred years ago. Noteworthy is the apparent diphtheria epidemic which was severe enough to prevent the library from issuing any books. Another column listed addresses with diphtheria cases that were reported to the health office. Newspapers also made mention of Fred Beell, wrestler and namesake of Beell Stadium, who perished in the line of duty while responding to a burglary at Marshfield Brewery on August 5, 1933. In an announcement in the Aug. 24 edition of The Marshfield News, Beell declared his candidacy for Sheriff of Wood County “on the Democratic ticket” in the primaries. “I shall appreciate your vote and if elected will fill the office to the best of my ability,” he stated. Beell served as a relief police officer from 1921 to 1933.